--Sharp, wear-resistant and high efficiency. Optimal RPM 2200, Max RPM 12000. --Can be used Dry but Best Results are with Water. --Perfect for Granite, Concrete, Marble, Stone, Tiles etc. --Pro Grade Wet/Dry, Diameter 4", Height 2.5 MM, Velcro Backed Flexible. --Aggressive and Durable made with quality Diamond Powder impregnated in Resin. 1.When wet polishing, use a continuous flow of water at low RPM for best results and finish. used with water for the best result. 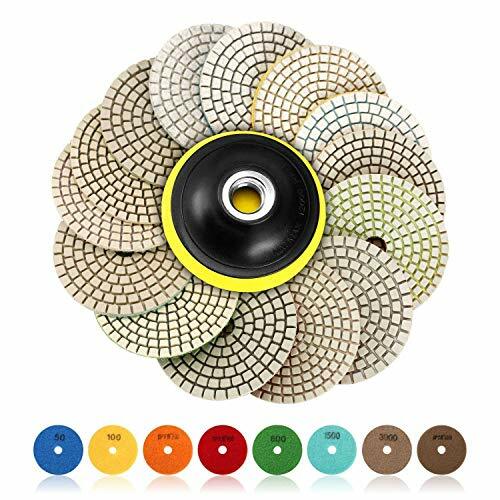 Package includes: 14pcs mix grit wet polishing pads (50#,100#,200#,400#,800#,1500#,3000#,6000#), 1pc Velcro Backing Pad (5/8" hole x 11 thread). Material: diamond powder and resin powder. Aggressive and Durable made with quality Diamond Powder impregnated in Resin. Specific points: Sharp, wear-resistant and high efficiency. Optimal RPM 2200, Max RPM 12000. Diameter 4", Height 3 MM, Velcro Backed Flexible. Applications: Great For All Solid Surface Materials. Perfect for Granite, Concrete, Marble, Stone, Tiles etc. Can be used Dry but Best Results are with Water. After sale: We supply fast and convenient return or replace service to insure purchasing without worries.